If you have been following this blog, you know that we are developing engaging activities to help our students use French “beyond the walls of the classroom”. 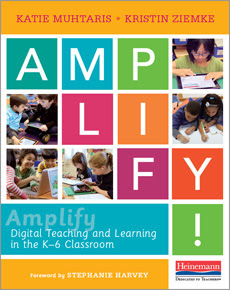 I recently read the book “Amplify” by Katie Muhtaris and Kristin Ziemke. After reading, what really stuck with me was the authors’ message: if there is good pedagogy, then technology amplifies learning. I think this is true of our project. In our early days, Bev Moss and I reflected after playing a “Guess My Number” game with her class. We did a Google Hangout and her class had to guess my number and I also had to try and guess theirs. We took turns. It was the day after Halloween in fact, and I was at home on maternity leave. She asked me casually (in French) what I was doing that afternoon. And I lifted up some of my kids’ Halloween Candy and proudly shared: “Je mange les bonbons de l’Halloween de mes enfants”. We laughed and modelled a bit of conversation in front of her students. Afterwards, she had a conversation with her class. They were excited about the hangout and inspired. They shared that they could understand what we said to each other and were very proud. She pressed them further and they shared all kinds of listening and speaking strategies that they had used. This kind of stuck with me because our initial data has revealed that students are very comfortable using non-verbal strategies, and less comfortable using verbal strategies. While the activities we are developing are without a doubt engaging. It really is what you do afterwards - the reflect and connect piece, if you will, that is really important. Help students identify their strengths, their needs and their next steps in learning. And then, most importantly, give them a chance to practice and apply their skills! I found your blog praiseworthy. I went through various articles published by you and merely found them remarkable. The way you keep on imparting your valuable insights keeping the article informative is appreciable. Keep sharing and continue updating.